Surely a greater percentage of tourists who have visited ancient Corinth have stopped at the Corinth Canal for a photograph. The canal was constructed between 1881 and 1893. A much smaller number probably recall that there was an ancient paved road, called the diolkos, on which smaller boats could be dragged across the isthmus. Ancient Diolkos Sign. Photo by Ferrell Jenkins. Pettigrew (Corinthian Matters) says that Strabo uses the term diolkos of the narrow land strip, rather than a physical road. Interestingly, the modern use of the term “diolkos“ is one of the great misnomers of modern scholarship. Strabo uses the word in a geographic sense to describe a land strip visible from Acrocorinth and equivalent to the narrowest part of the Isthmus. No one in antiquity associated the term with the physical road. Bust of Neo. Corinth Museum. The cargo of larger ships was unloaded and carried across the isthmus and reloaded. Ships that could be dragged across the land bridge avoided the 200 mile journey around the Peloponnesus. 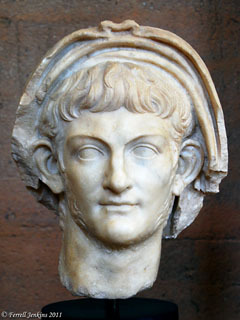 Nero abandoned his attempts to dig a canal across the isthmus in A.D. 67. Josephus records that 6,000 of the strongest men involved in the Galilean revolt were sent to Nero, “to dig through the Isthmus [of Corinth]” (JW. 3.540). David Pettigrew recently spent two days touring the diolkos. He includes some nice photos (here) that are large enough for use in presentations. He also includes a plan allowing identification of each photo. Yesterday I received a new scanner and decided to pull out my old slides of the diolkos. The date is so faded on the slide frame that I am unable to read it. I think the photos were made in the early 1970s. Compare this will Pettegrew’s recent (first) photo of the same area. Diolkos Sign and a portion of Sector G. Photo by Ferrell Jenkins. Here is a closer view of the same sector. In Pettegrew’s photos this area has been cleared of dirt to show more of the paving. Diolkos Sector G. Photo by Ferrell Jenkins in the 1970s. Below is my photo of Sector E from the early 1970s. Compare with Pettegrew’s photo (which appears to have been made earlier than his other photos). Leon Mauldin has a photo made in early 2010 here. Diolkos - Sector E in the 1970s. Photo by Ferrell Jenkins. Dr. Pettegrew was able to visit Sector K, the only section on the north side of the Corinth canal. His post documents the damage being done to the diolkos by ships passing through the Corinth canal. In addition to the new photos here, he has a section dealing with the diolkos under the heading Isthmus. The diolkos was in use during the time Paul was at Corinth. The commercial benefit to Corinth, as well as to the port cities of Lechaion and Cenchrea, was significant. In addition to the video’s at Corinthian Matters, there is one here featuring comments by Sophia Loverdou. This entry was posted in Bible Places, Bible Study, Greece, New Testament, Photography, Travel. Bookmark the permalink.